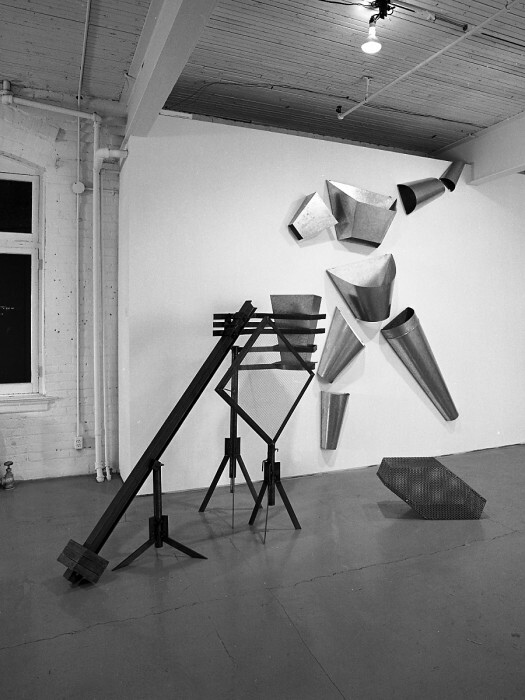 This exhibition by Toronto artist Bernie Miller features installed sculpture. 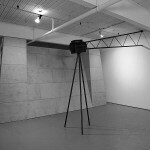 Using primarily industrial materials, the sculptural imagery is presented as a tableau combining references to “science fiction, speakers, ductwork, communications spectacle, antennae, the culture industry, archaic scientific apparati, disjecta membra, figures of hope, screens and building”. 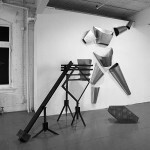 The artist’s previous work has reflected his concern with relationships of technology and culture. In this exhibition, the work is bound together generally by an interest in the ‘future’ as an historical substantive concept, and by the use of this concept as a paradigm. Bernie Miller graduated from the Ontario College of Art in 1974. Since that time he has participated in group exhibitions and projects in Toronto including shows at The Art Gallery of Ontario, Factory 77, Mercer Union, YYZ, and Visual Arts Ontario, and at the Cambridge Art Centre. His work has been featured in solo exhibitions at Galerie Scollard (1977), Glendon Gallery (1982), the Art Gallery of Brant (1982), and Eye-Level in Halifax (1985). Radio Theory (1985) and Future Use (1985) are finely orchestrated sculptural assemblages of the stuff that’s interested Toronto artist Bernie Miller for years — electric wires, air ducts, industrial appliances, radios, electronic gadgets and other artifacts salvaged from our electro mechanical civilization. But this show is hardly fun and games at the Science Centre. As usual in Miller s work, the gadgets have been combined into impressive, comprehending images meant to analyze some large cultural issue on the artist’s mind — in this case, the mechanisms of opinion-making and soul-shaping in modern urban society. If this show is vintage Miller in style, however, it is outstanding in power and effectiveness. Future Use, the larger and more successful of the two works here, is composed of a tall, ominous stone rampart, of the sort one might find ringing a maximum security prison. Standing outside the wall, we face illusive images of surveillance and observation –the guard tower, the glaring search light beam (sculpted in metal), the hidden watchers. Within the wall, however, we find a secret world of imagery, being churned out by a motion picture projector, a sulphurous fluorescent tube, a heap of radios and other electric gizmos casting a shadow reminiscent of the high rise cityscape. Taken together, the two sides of Miller’s piece argue one point: that the structuring of our social imagination which architecture and police once did, is now also being done by the fantastic environment of visual images in which we live. It’s not a new idea about technology and society. But it has perhaps never before been asserted so brilliantly in a purely visual work of Toronto art. Bernie Miller’s installation seems much like a miniature model of one of Hollywood’s large motion-picture studio-lots where one can linger among fantastic facades lining the streets of phantom cities which are braced against the world of everyday with monumental walls. But, above its physical similarities, this work unravels the process of production of the spectacle, of which the motion picture industry is only the most obvious, the most visible instrument. Here, at Mercer Union, a large wall restricts our view of the back of the gallery. Its stark architectural features are sphinx-like and oscillate between those of an ancient temple, a medieval fortress, and a contemporary bank modeled from archaic architectural codes. It is opaque and divisive; it functions to secure the space behind and impose, impress upon the face in front. 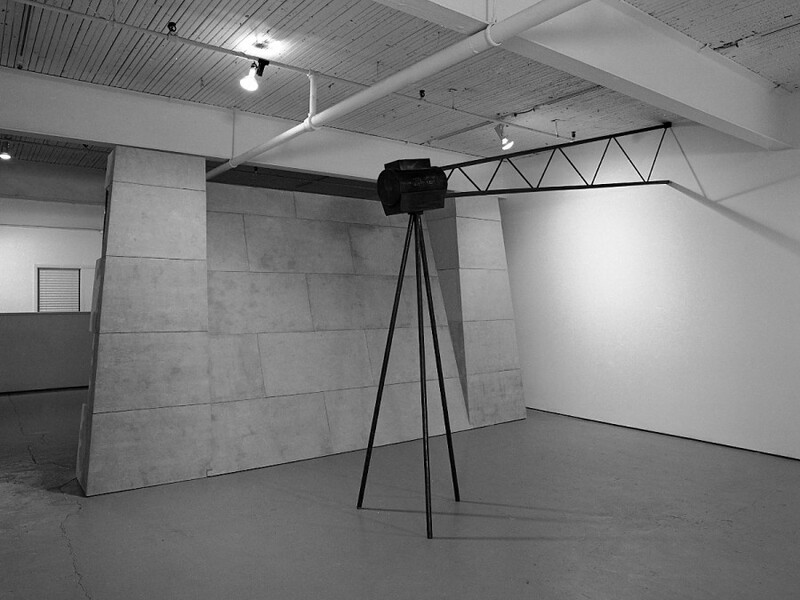 To emphasize even more its characteristics a large welded stage light which projects a large steel “beam” parallel to the wall, serves as a logo or three-dimensional monument for that which the wall so sternly protects. From behind the wall a violet haze leaks into our space which seems both chemically produced and television-like. It is a lure: motion, production, and alchemical processes are going on “behind the scenes”. 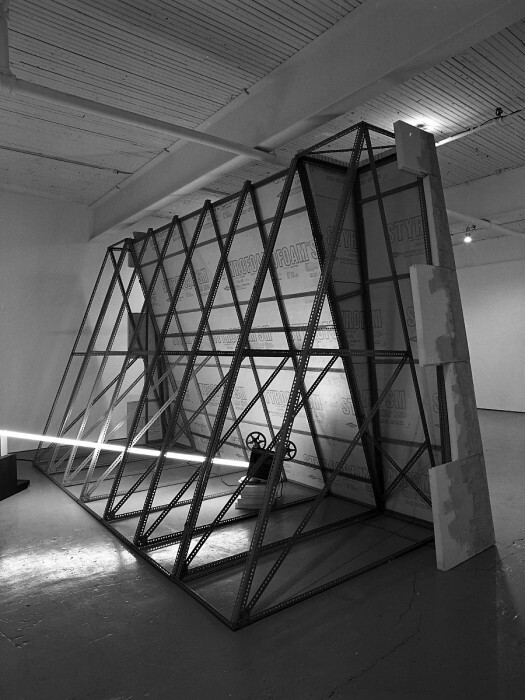 The monumental stage light situated in front of the wall projects it’s large welded steel “beam” into the sidewall of the gallery. Its formal structure seems similar to the posturing of socialist realism’s sculptures, pointing, so it seems, to an ever distant utopian future. The welded beam (resembling both a projected light and an architectural crossbeam) disappears into a space beyond the wall, gazing, so it seems, into an imaginary future, a better, brighter, future, a future that is the dream of everyone. In a timeless fashion this light evokes the individual and collective projections of what the future may become; it guides visions (or, the gaze) which permeate ideology, drive the desire for progress, and justify colonial interests. The round encasing for the light bulb is propped by a tripod: it is like a head without a body. The single head projects light reason – logos. It foresees, illuminates, and reaches the stars for us all so that our misdirected gaze, instead of focusing on the production of the spectacle hidden in the “temple of the industry” may be focused on the future, and may make us think that in the end there will be heaven. 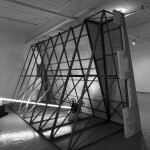 Miller’s installation consists of two spaces which are divided by a wall. But, the central object in both spaces is the beam of light: behind the wall the projector keeps running a “live” light, and in front of the wall the welded structure is a fossilized representation of light. This emphasis on light makes brilliantly clear “the Western philosophical project” which privileges the sense of vision before all others and structures the world in terms of gaze and sight; the projection of light, the projection of the gaze and of vision here are seen at the centre of the energy which drives motion, production, and development. It is also at the centre of the project of reason, the goal of which is knowledge, power and certainty. And, beyond reason, vision lives in our dreams, and in our expectations of the future. 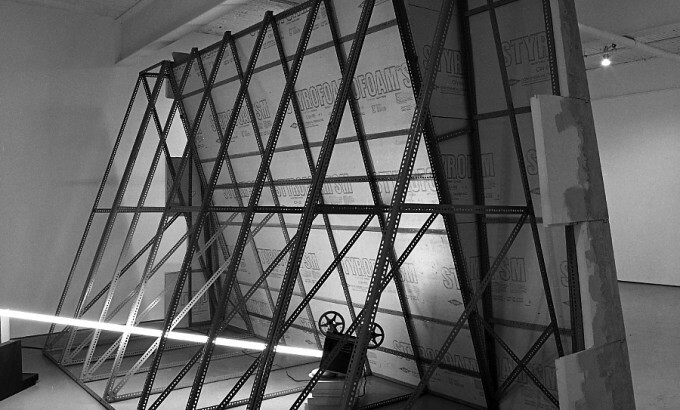 When we stand in line with the wall which divides this installation we can observe that both beams of light point in two different directions and focus upon an essentially different “object.” The projector light produces an image of power; it is also an image which one suspects will fill the television and movie screens everywhere. The stage-light does not produce a concrete picture; instead it stands for the “dream” which, we may conclude, is really produced behind the walls of the “industry.” This installation then represents the workings of the spectacle which, by utilizing our dreams, will reproduce over and over again hierarchic and patriarchal society. As observers in this work we become involved in this tautological structure, where reality rises up within the spectacle and where the spectacle produces the real. Inevitably, this entanglement brings forth urgent questions; what lies outside this structure? What has been banned from expression? How can this existing order “not be overturned,” but rather, radically changed? A restructuring of the hierarchy of the senses, of the laws based on vision, seems to suggest itself.